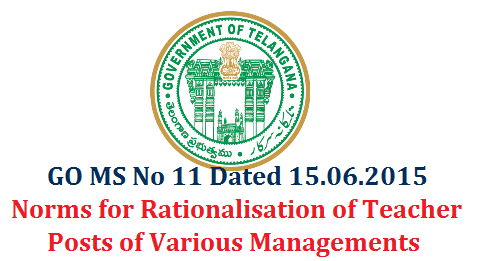 Government in the reference 1st read above issued Orders to take up the exercise of Rationalization of staff in the schools in the year 2014, strictly in accordance with the norms and standards given in the Schedule of the Right to Education Act, in order to implement the provisions of the Act. The Director of School Education, Telangana, Hyderabad, in his letter 2nd read above has submitted proposals in view of the large number of vacancies in the schools and to provide minimum number of staff and explaining the need to take up rationalization of posts based on UDISE- 2014-2015, for providing qualitative education to the children. The Headmaster of Primary Schools posts to the Primary Schools having strength of 151 and above may be provided. The LFL HM posts having strength of 150 and below may be adjusted against the SGT posts in the Schools. Posting on rationalization is subject to post(s) sanctioned for the school as per the above staff pattern. In view of the large number of vacancies in SGT category only one SGT is proposed in the ratio 1 : 30 so as to prevent the closure of schools for want of staff. For I to V Classes in a Upper Primary School, same norms (staff pattern) of a Primary School given in Annexure I will be applicable for provision of SGTs. The senior most School Assistant in the Upper Primary School shall be Head Master of that school. School Asst. (Maths / Science) can be occupied by School Asst. (Maths) or School Asst. (PS) or School Asst. (BS) as per the subject post sanctioned for UPS. Time Table should be prepared as per the subjects studied by the Teacher in X class (SSC) / Inter / Degree and subject methodology in B.Ed / D. Ed / Language Pandit Training. Teacher cannot refuse to handle classes as per the Time Table so prepared. School Assistants / Language Pandits are supposed to handle their subjects specifically and other subjects in general for other classes including Primary Sections according to need. The optimum strength of a class/ section is 40. The maximum strength of a class/section is 60. The second section of a class shall be formed, if the strength of class exceeds 60. Third section shall be formed if the strength of the class exceeds 100. Similarly 4th, 5th sections etc., shall be formed, when enrolment in a class exceeds 140 and 180 respectively.